Fox Media Lab has evolved from small marketing firm, providing media services, to a company that capitalizes on market changes. Fox Media Lab's evolution from exclusively providing media services to “creating” media has come naturally. The Lab experiments with Internet business models. The Lab also provides evaluation and execution services for a myriad of media and communication objectives including product and site launches, service evaluations and even product recommendations. One business model incubated the last four years is UBZ2.COM, a maturing social networking portal that provides Sports Team and Activities Management. UBZ2 is designed to house the most comprehensive “Schedule” for sports and activities on the Internet. It is the Lab's first incubation to be offered for funding or purchase. Fox works on several Internet incubations at any given time you may see some of them here under "clients". Fox Media Lab consults on a variety of media projects that are unique and entirely custom designed by their clients. The Lab also provides analysis of consumer electronics "communication" devices of all sorts. Their primary focus is the way the mass market use them. The company's ownership initiated in 1988 in Wellesley, MA, with Jarmila Dubska and Joseph Fox, in Dubska+Fox Advertising. She was an old master in design layout, trained in Prague. Joe Fox bought Dubska Fox Advertising one year after its formation in 1986 precipitating the company’s first name change. Fox then moved the company to Natick, MA in 1988 where it is still today. 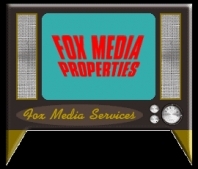 The company changed its name with that move to Fox Media Services, (FMS). Until their recent name change Fox Media Services provided direct response media strategy, palnning and placement, specializing in National Cable TV, Commonly known as DRTV. Fox Media Lab with its long heritage will be into their 21st year on April 1st, 2008. Fox Media Lab and its earlier incarnations grandfathered marketing on the Internet. FMS was the first DR Media Firm on the net. Fox Media Services sales advantage and unique offer, was to provide media services with and by a ‘computer’”. For more than a decade they were know for their DRTV Buys. Over the years Fox has managed, represented, or consulted on a wide variety of media services to include media representation, media company funding, media strategy, media market analysis, and many custom client dictated projects. Some of those projects include the markets of streaming media, User Generated Content, Digital Asset Management, Digital Downloading, Digital Production.